This is a chronologic listing of bathing scenes that appeared in anime, manga and other related media in the year 2000. 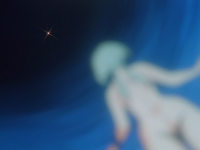 "Steel Angel Kurumi episode 11"
Marlene Angel is Skinny Dipping in a Dream Sequence. "Steel Angel Kurumi episode 14"
There is a Shower Room scene with Alicia Whistle and Marlene Angel in Shower Stalls. "Ojamajo Doremi Sharp episode 2"
"Initial D: Extra Stage episode 1"
"Hunter x Hunter episode 18"
Kurapika has a Shower. Hanzo has an Off Screen bathing scene. Ponzu takes a Bath with one of Bourbon's snakes. Leorio Paradinight takes a Shower. Pedro, Sandora and Nabeshin have Waterfall Shower. Yakumo Tatsuro has a Skinny Dipping scene. "Daa! Daa! Daa! 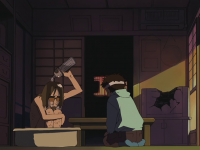 episode 1"
Keitaro Urashima falls off of a Mecha-Tama while Clothed into the Hot Spring that Mitsune Konno, Kaolla Su, Naru Narusegawa, Shinobu Maehara and Motoko Aoyama are bathing in. Keitaro is seen trying to apologize to Shinobu who is running away but gets hit by the wind blast from Motoko's sword, then gets kicked by Kaolla Su and then finally punched into the sky by Naru. When Keitaro Urashima finds that the Hinata Apartments has a Hot Spring he decides to start bathing in it while only wearing a Towel. In the bath he ends up meeting Naru Narusegawa who doesn't have her contacts on and mistakes Keitaro for her friend Mitsune Konno. When Naru finds out that shes actually bathing with a guy, she freaks out dragging Keitaro around the Hot Spring and eventually kicking him into the changing room where Mistune is shown in only a towel intending to take a bath but then helps Naru chase Keitaro out instead. Later on after the girls are aware that he is the new manager, Keitaro does various chores around the house to try to make them appreciate him while one of them was cleaning the outdoor bath. While cleaning the outdoor bath he is daydreaming that Naru is coming out in only a towel likely to get ready to bathe. At the end of the episode Keitaro is seen bathing in the newly found males bath of the Hinata Apartments which is a wooden bathtub on a balcony on the side of the building. Keitaro looks out the balcony and is able to see the Hot Spring which Naru happens to be bathing in at the time. She gets mad at Keitaro for Peeping at her and manages to hit him from that far away sending him flying off. 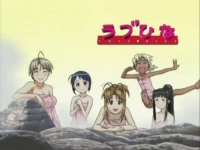 Mitsune Konna, Shinobu Maehara, Naru Narusegawa, Kaolla Su, and Motoko Aoyama are shown bathing in a Hot Spring while wearing pink towels. Naota Nandaba has a Furo scene. Mitsune Konno, Haruka Urashima and Naru Narusegawa bathing in a Hot Spring together. Mitsune Konno, Naru Narusegawa, Shinobu Maehara and Kaolla Su bathing in a Hot Spring together. 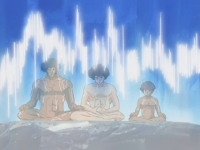 Naru Narusegawa, Shinobu Maehara, Mitsune Konno, Kaolla Su and Motoko Aoyama bathing in a Hot Spring together. There is a Hot Spring scene with Keitaro Urashima and Naru Narusegawa. "Ayashi no Ceres episode 5"
There is a Shower scene between Naru Narusegawa and Mutsumi Otohime. Later on, Mitsune Konno, Shinobu Maehara, Naru Narusegawa, Motoko Aoyama and Kaolla Su to a bath somewhere. There is a Dream Sequence Bathing scene with Keitaro Urashima in a Hot Spring with a Clothed Naru Narusegawa. Later on, Kentaro Sakata has a Hot Spring scene with three old men. There is a Hot Spring scene between Motoko Aoyama and Naru Narusegawa. "Ayashi no Ceres episode 8"
"Great Teacher Onizuka episode 35"
There is a Bubble Bath scene with Julia Murai. Keitaro Urashima and Naru Narusegawa in a Hot Spring while Clothed. There is a Hot Spring scene with Mitsune Konno, Naru Narusegawa, Shinobu Maehara, Motoko Aoyama, Amalla Su and an alligator. Keitaro Urashima in a Bath that Naru Narusegawa jumps into while Clothed. Later on, Motoko Aoyama, Mitsune Konno, Shinobu Maehara, Naru Narusegawa and Kaolla Su bathe in a Hot Spring together and Sing. 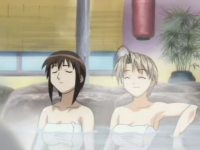 Naru Narusegawa, Motoko Aoyama, Shinobu Maehara and Kaolla Su bathing to together in a Hot Spring. Later on, all of them except Motoko take another bath but Mitsune Konno is there this time. "Ayashi no Ceres episode 12"
"Ayashi no Ceres episode 13"
"Digimon Adventure 02 episode 15"
There is a Bubble Bath scene with Nami. "Steel Angel Kurumi: Encore episode 1"
There is a Furo scene with Kurumi and Saki. There is a Hot Spring scene with Seta Noriyasu. "Ayashi no Ceres episode 15"
Haruka Urashima bathing in a Hot Spring. There is multiple Hot Spring scenes. There is a Furo scene with Eri Ninamori. There is a Clothed Bathing scene and a Hot Spring scene with Lamba Lu. "Ayashi no Ceres episode 21"
There is an image of Naru Narusegawa bathing with her father and later a Hot Spring scene. "Brigadoon: Marin & Melan episode 9"
There is a Flashback Bathing Scene of Mutsumi Otohime in the Shower. "Brigadoon: Marin & Melan episode 10"
"Hunter x Hunter episode 42"
Hisoka has a Shower scene. There is a Bath scene with Kamon Nandaba. Kagome Higurashi Skinny Dips in a lake and later has a Bath scene. "Hajime no Ippo episode 5"
"Hunter x Hunter episode 46"
Killua Zoldyck and Gon Freecs in a Furo scene. "Brigadoon: Marin & Melan episode 17"
There is a Barrel bath scene. This page was last modified on 7 October 2018, at 17:17.